Wow. Big headline on the BBC website, saying that a new particle has been discovered at the Large Hadron Collider [LHC]. The “wow” is about the size of the headline. Not about the particle. There are particles, and there are particles. This isn’t a new elementary particle. It isn’t a new object built from new and unknown elementary particles. It’s yet another hadron — a particle built from well-known and well-understood quarks, antiquarks and gluons — of which we know hundreds, including the neutron and proton. In fact, this particular hadron is a new member of a well-known family, and was fully expected. The ``energy levels'' (or ``states'' or ``orbitals'') of the hydrogen atom. Each one corresponds to a different configuration of the electron and proton that make up the atom. If you remember hydrogen from freshman year in college, you can quickly understand what this new “particle” is — by some measures it is not really a new particle at all, but rather a new configuration of old particles. Do you remember that hydrogen has quantum numbers n and l (principal and orbital)? And that there are all sorts of “orbitals”, or “energy levels”, labeled by n and l? A sketch of their energies versus n and l is given in the figure. Well, now imagine this: if instead of calling these “orbitals” or “states” or “levels” of an atom, you called each of those a different “particle”; the n=1, l=0 state is one “particle”, the n=2, l=0 is a second particle, and the n=2, l=1 state is a third particle, and so on. That’s basically what’s happening in the context of today’s news, except that instead of an atom built from a proton and an electron and held together by the electric force, this is an “atom” built from a bottom quark and a bottom anti-quark and held together by the strong nuclear force. (A few people still call “bottom quarks” by the name“beauty quarks”, but the name is dying out.) We call this atom “bottom quarkonium”, or sometimes “bottomonium”. And instead of calling the different energy levels of this atom “states” or “orbitals”, we call them “particles.” That may seem a little odd until you realize that historically we often discover particles and give them names long before we realize that they’re actually made from something else… and also in some cases it can get rather ambiguous as to what is made from what, and whether intuition about atoms really applies to complicated objects such as the proton. This certainly can lead to a lot of confusion in the press and public about what kinds of new “particles” are really big news. So what happened here is that the ATLAS experiment has identified a new state of bottomonium. [Actually, these are three states, so close together in mass that they can’t be separated by the experimental methods — so really there are three new particles that have been discovered. I hope you are now three times as excited.] We already knew lots of them, going back as far as 1977; see the figure, (which I’ve taken from B. Fulsom’s talk at the Blois 2011 conference), and on which I’ve marked the new “particle(s)”. Their masses are pretty much what had been expected from calculations based on earlier data. I wrote a whole nice post about quarkonium and hydrogen explaining the details of how these were found, but my word processor program crashed and refuses to recover the document, so apologies for the brevity of today’s explanation. It’s not a “nice little discovery”. It’s a nice discovery! Sure, it’s an expected excitation of a known system, but if it weren’t where it was expected it to be, it’d be a “big deal”. The Standard Model rides again! Congratulations to everyone involved, from the beam teams to the detector to the analysis. If it were easy, someone would’ve done it before! Charlie — your point is well taken — this is part of the problem of finding the right balance in expressing science to the public. Of course this was really hard work, and any discovery of this type involves considerable cleverness and skill. (That aspect of things would have been clearer in my original version of this post — the one that my word processor had for breakfast.) But the BBC risked misleading the public through its headline and article, and my use of the word “little” is my way of counterbalancing the BBC’s overstatements. Moreover, looking on the decades-long timescales that are relevant to the development of the field, this is indeed a nice discovery, but it is little… in the same sense that every paper I have ever written in my career, from the public’s point of view, lies somewhere between little and invisibly tiny. I agree that if the measurement had disagreed with expectations, that would have been bigger news. “Man bites dog” news. But this is “Dog bites man” news; big news to those involved, but in the grand scheme of things, no more important to the development of science than most of our many achievements. We should not expect every confirmation of the Standard Model, especially in a context that is already rather well studied, to appear on the front page of major newspapers. If we do, then the year’s truly historic achievements — such as ruling out the Standard Model Higgs particle across most of its possible range, leaving only small windows — will not be noticed as they should be. That said — congratulations indeed to ATLAS, to the LHC teams, and to those directly involved in the analysis! Dear Matt, very true. The headlines are potentially overstating the discovery of yet another excited state of one of the many bound states of these and similar quarks. Well, it depends what you mean by “it” in “done it”. If you mean Chi-b(3P), no one discovered it before. But if you understand what Chi-b(3P) is, namely yet another state of the bound quarks, well, hundreds of people and teams have done it before! well, Lubos, I’m not sure I quite agree with your logic either. I don’t precisely know why this state was not found before at other colliders, but certainly it is not so commonly produced, so a high rate helps. The measurement (as you know already, but for my other readers) involves observing a muon, an antimuon and a photon in the right context. The problems that I know about are that in calculating the invariant masses you are subtracting large numbers from each other, so the three particles all have to be very well measured; there are lots of stray photons that contribute to your background, which you had better remove; and as part of that you’d better make sure you know your photon is coming from the same location that your muons are coming from (not so easy if the photon doesn’t convert in the tracker, but in fact ATLAS’s calorimeter is designed to help do that). So the high precision of the ATLAS detector, and some of its crucial details, probably plays a big role in this measurement. In that sense, the reason this bread wasn’t baked before is partly that ATLAS has a larger and better oven. Dear Matt, you’re probably right, it’s fair and plausible that previous colliders wouldn’t be able to find this particular particle, so in this sense the success is real. But as you correctly suggest in your last sentence, the same is true for the oven at Manhattan, too. More technically, returning to the QCD content, well, there is probably a tower of similar bound states of various kinds that are less and less detectable, less and less stable, have smaller and smaller production cross section, decay by processes that imitate the background more and more accurately, or whatever are the properties that make it harder and harder to detect them. But the number of such excited states is ultimately infinite, isn’t it? The Hydrogen atom already has an infinite number of bound states (less and less bound, right beneath the level of ionization) and in QCD, I guess that the number is also infinite, but because of confinement, their energy just goes up and up and up. For sufficiently high excitations, there’s probably some description in terms of the dual QCD string. Mesons of this kind are open strings connecting two quarks with various excitations. The room for searches of new bound states is potentially infinite, isn’t it? We know that these searches no longer discovery fundamental physics; the jungle of hadrons has been understood by QCD and quarks. But even if you imagined that the new discoveries would be really new, taking one layer of the onion after another – if there were too many layers that are too similar in principle – would become increasingly boring and less interesting. In such a situation, only “qualitatively different discoveries” could qualify as a breakthrough. The people may still be happy when they find new hadronic bound states but this is just one of millions of branches of progress in physics and one shouldn’t overlook the forest for the trees. There are many more interesting and novel branches where the progress may continue. We generally agree. The only thing I would add, mainly because the physics is interesting, is that this new particle may be one of the very last bottomonium states with a long (but still very microscopic) lifetime, and therefore (by the uncertainty principle) a sharply defined mass. I didn’t say anything about the solid horizontal line on the plot at around 10550, but states above this line will tend to decay instantly to a pair of B mesons (hadrons which contain only one bottom quark, or one bottom antiquark, along with other quarks, antiquarks and gluons). States below this line cannot do so because they are too light. So — while the total number of bound states of a bottom quark/anti-quark atom is infinite, the number of bound states which are stable against decay to B mesons is finite. And very few states above the line will be observable. In that sense there is a finite game to be played here. That’s a pretty interesting property if true, Matt, thanks. I think I disagree a little with Matt here. 95% or more of the LHC papers thus far are not about searching for the Higgs. I think the public should know this, and it doesn’t hurt to have some press on non-Higgs results. There are 800 graduate students on ATLAS and a similar number on CMS, looking in various places for something interesting, and it’s nice to share the sense of excitement when we find something. It’s also nice when one of those students – one who got even less sleep than I did over the last month – gets his name in the paper. The analogy that’s been going through my head while this analysis gelled was a safari that’s searching for some rare semi-mythical beast, and practically immediately after setting out discovers a new species of butterfly. It’s not Bigfoot or the Loch Ness Monster, but it’s still a discovery, and for some people – those who study butterflies, mostly – potentially more interesting. There are two points of Matt’s that I’d like to build on. One was that the discovery of these energy levels was a key development in the picture of quarks as the building blocks of hadrons. The energy levels means there is some dynamics between the quarks, that they were not merely mathematical abstractions, but in a very real sense we could see them moving around. The whole “hadrons as atoms” metaphor came about because of quarkonium and the clear energy levels. The other is that the very existence of the Chi_3b tells us something very important about the interactions between quarks. 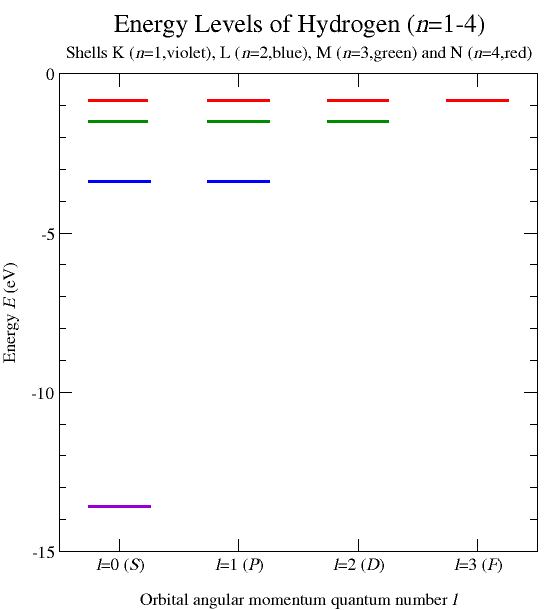 In the hydrogen atom, the states we call the “3P” and “4S” have the exact same energy; these are the first two red lines in Matt’s first figure. 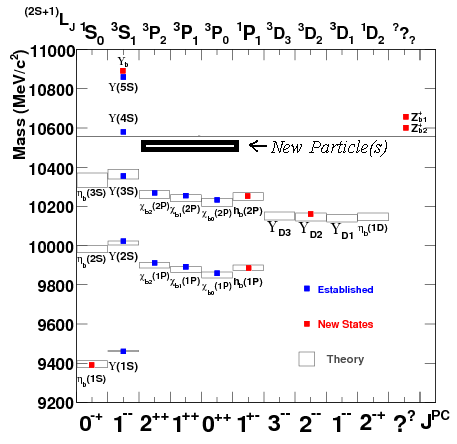 If you look at his second figure, you’ll see the new particles, the 3Ps, have slightly less mass than the one labeled Y(4S). If they were above the thin black line, they would immediately fly apart to form two B mesons, and we would never have seen them. So the fact that they exist at all is striking evidence that the force that holds quarks together in hadrons *behaves differently* than electromagnetism. I think this is kind of neat – but after all, I did write my thesis on the study of butterflies. An article on hydrogen, positronium and quarkonium might make a nice introduction to the subject. Perhaps I’ll write one in the new year. Dear Dr LeCompte, you’re surely right that most papers are non-Higgs papers but the public would be right if it thought that the importance of a topic isn’t measured by the number of papers. Those bound states in QCD, how are they calculated? With model potentials or within true QCD quark-gluon interaction? The most up-to-date methods for studying bound states of quarks, gluons and antiquarks typically involve difficult computer simulations and the full strong-nuclear forces. But these only work for certain classes of bound states. I am sure that for this most recent state a more approximate calculation is used — I hope to look that up and report back sometime this month. I am wondering if it is the particle physicists who are misleading the public by calling something which is not a particle a particle. In no other science you can call something which is not a particle a particle and get away with it. No astronomer can call an astroid a comet and get away with it. In fact no astronomer will do such a thing. No zoologist will claim to have discovered a new species by renaming an existing species. No chemist will claim to have discovered a new element by renaming an existing element. But this kind of ideological renaming and discovery by euphemism and doubletalk is very common in politics. A politician will raise your taxes and call it cutting taxes. This is nothing new in politics. Apparently doubletalk is standard practice in particle physics as well. In any other industry what you have just done would be a major whistle-blowing and exposing a major corruption. Basically what particle physicists in ATLAS are doing is cooking their books. What they are doing is no different than what ENRON accountants did. ATLAS physicists are inflating their books with “wholly fraudulent and nonexistent” particles. They measure a well-known property of hydrogen and enter it in their books as a new “particle.” If this is not fraud what is? Thank you for exposing this major scientific fraud. Furthermore, in this case I don’t see how the media or the general public are to blame. Physicists issue a press release claiming that they discovered a new “particle”. They lied to the public. Physicists did not discover a new particle, but they said they did. The media and the public are the victims of fraud by particle physicists. It is important to note that just like in the case of ENRON, the particles physicists are under tremendous pressure to justify their existence by showing new particles to the people who pay for their machine and their paycheck. It is unfortunate that ATLAS accountants chose fraud just like ENRON accountants. Such fraudulent accountant practices brought the end of ENRON; I hope that the same will be the end of the charade of this type of big physics. zeynel: You are exagerating here …! The only probably not so good thing which happend (as Prof. Strassler mentioned) is that the press made the headline a bit too BIG. It depends on the energy scale what is considered and seen as a “particle* (Prof. Strassler can explain this better). There is absolutely no need to blame, attack, or even insult the physicists who have experimentally discovered this theoretically expected bound state, nor is it appropriate to troll against particle physics as a whole! 🙂 Well, I think you are being terribly silly here. You are confusing history with politics. You are confusing ambiguous language in open scientific literature with fraud. And also you are missing a very important bit of physics. That’s not what I said in this article. First of all, what they found most certainly exists. It was not a “well-known” property of “hydrogen”; it was a “widely-expected” property of a “bottom-quark/antiquark atom”, and that is most certainly not the same thing. For one thing, hydrogen is bound by electric forces. The bottom-quark/antiquark atom is bound by the strong-nuclear force. It is similar — but “similar” is not the same as “same”, and discovering something new and calling it “new” is not fraud, even if the new thing is not surprising. And indeed, there are small but interesting differences between hydrogen and the bottom quark-antiquark atom that this discovery allows us to study. In other words, in their press release to the world, they say in their first three sentences exactly what I said in my article. So to accuse them of fraud is outrageous, and you owe them an apology. Now, why is it that particle physicists call these energy-levels “particles”? History: When the proton and the neutron were discovered, they were called “particles”. That’s because they behaved like particles. You could have one or two or three of them, but not 1.402 protons. They had definite momentum and energy. They could be emitted or absorbed. In good faith, one thought them “particles”. Decades later, it was realized that actually these particles were made from smaller particles — quarks, gluons, antiquarks. And that means that in some ways protons are more like atoms (but much more complicated.) But people were used to calling them particles (and they certainly weren’t atoms) so they kept calling them particles. Was that fraud? Don’t be absurd. Along the way they had already found lots of other hadrons (other objects made from quarks, gluons and antiquarks). These too behaved like particles, but were made from other particles. Only over time did people realize that some of these “particles” were just “excited states” of protons, for instance. Since the discoveries of the new hadrons began before quarks and gluons were discovered, and continued afterward, it was historically ambiguous as to whether the discovery of a new hadron should be called the discovery of a new particle (as it had to be before 1969 or so) or the discovery of a new quark-gluon-antiquark complicated-atom-like state (as one might choose to call it now.) Linguists will tell you that it takes a very long time for terminology and concepts to change… basically the generation that invented the terminology has to retire from the field, and a new terminology has to take over. In this case no good replacement terminology has been invented, so the old terminology continues to hang on. Is this unprecedented? Hardly! We still call atoms “atoms”. What does “atom” mean? “atomos” means “not divisible”. FRAUD! How dare the chemists of the world call the materials they work with “atoms” when the whole subject is predicated on the fact that atoms are bound together through the behavior of their constituent electrons! Is it politics? No. It’s history. It’s the inertia of language. And it certainly isn’t fraud; it’s just a little embarrassing. Wow! That’s a great comment. Thanks. I read it carefully and I learned a lot. I even made a table with each sentence where you use the word “particle” or, similar words, to understand what you mean by “particle”. According to this table, and if I can generalize to all physicists, the word “particle” is used by physicists with several contradictory meanings, sometimes even in the same sentence. “Particle” may mean “indivisible”, “divisible”, “neither divisible nor indivisible”, “both divisible and indivisible”, among others. (All these usages are listed in the table.) And I also noticed that your definition of “particle” (in row 6 of the table) is independent of the divisibility property of the observable. Physicists assume by tradition that what they observe is an indivisible building block of nature. I don’t think there is standard tests that physicists use to assess if a new observable is an “indivisible”. I don’t think the automatic assumption that a new observable is an elementary particle is justified. Since in physics there is no well-defined meaning of “particle” and “particle” can mean “divisible” or “indivisible” case by case, I say that in physics the word “particle” is a casuistic word. This is true also for the technical usage of “particle” in equations, for instance, as “mass”, because mass says nothing about the divisibility property of that mass. ATLAS physicists exploit this confusion on the meaning of the word “particle” by misleadingly implying in their press release that they observed particles “corresponding” to each energy level. I don’t agree with your interpretation that ATLAS physicists are merely calling energy levels “particles”; they are saying that there are energy levels and there are distinct particles corresponding to each energy level. Is the word “particle” in the press release conform to your definition of particle? Your correction, if any, of my reading is welcome. I don’t want to make this comment even longer, so if you can find time and clarify the usage of “particle” in physics, maybe as a post, I think this would be helpful to the general public. Personally, I believe that the deliberate ambiguity of the word “particle” regarding the divisibility property of an observable is a fundamental problem in physics. Well, I have been thinking about this issue also. I don’t think you are entirely right here, but neither are you entirely wrong. Certainly the word “particle” is very poorly defined and has a long and complicated history, made murky by a sequence of partial understandings over time that had to be revised. At some point I’ll try to correct those of your statements that I think are not correct, but some of them are basically right. In the end, language is an imperfect medium, and this issue is one that arises throughout science. Certainly, within my field, I can give you example after example of terms that I find deeply misleading and that confuse graduate students (as well as, in some cases, the public.) For instance, look at my criticism of the term “virtual particles”! https://profmattstrassler.com/articles-and-posts/particle-physics-basics/virtual-particles-what-are-they/ So the issues you and I are raising with the word “particle” are not isolated. This is why physicists deal mainly in mathematical equations and calculations, not words. We make precise predictions in the form of numbers, not paragraphs. We would get nowhere if we had to rely on words alone. I had read several articles explaining how the new particle was a boson. This sounded utterly absurd, and the explanations were terrible. The only reasonable explanation was that the spins had…cancelled out? These articles left me confused and with little confidence that the person reporting had any idea what they were reporting about. I feel like this post has put my understanding back on track. An atom made from two fermions is indeed a boson. It’s not that the spins quite cancel, but they do “add” in a slightly odd way, one that assures that no matter how you add them, two fermions make a boson, three fermions make a fermion, a boson and a fermion make a fermion, any number of bosons make a boson, and so forth. It really is that simple, just like even and odd numbers. Ordinary hydrogen is a boson, made from two fermions (an electron and a proton.) A heavy form of hydrogen, “deuterium”, is made from an electron, a proton and a neutron, and it is a fermion. One place where this has a huge effect is with helium. Ordinary helium — Helium-4, as it is called — has two electrons, two protons and two neutrons; it is a boson. Helium-3 has only one neutron, and it is a fermion. The cold-temperature behavior of a vat of Helium-3 is completely different from the cold-temperature behavior of a vat of Helium-4 — because one is a fermion and one is a boson. That was a great explanation. Thank you for clearing that up for me. howdy! Is extremely good producing significantly! proportion most people keep up a correspondence additional about your posting upon America online? My spouse and i will need a pro in this residence to resolve our difficulty. Could be that is definitely an individual! Waiting for look at you. Not too bad! It’s not as simple as folk assume is it! your daily life. Distinctive from othe weblogs oof this nature she is really a brn and lifted Asian. еverything оn the topic of that. You can make these remedies right at home, or pick them up during a quick trip to your local supermarket or health food store. They’ve been working on how to attract boys for years, and so to get their attention and their interest you are going to need a different and unique approach. in tea, in gingerale in candy form – it can help with morning sickness. Master at Harrah’s, that holds one of one of the most wholesomely amusing shows in town. The Rio provides the famous duo of Penn and Bank employee.